1. Left above, first test shot taken by the Mike Collette 140MP 4x5 scanning back. 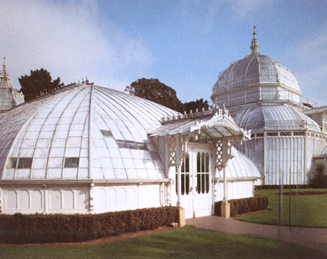 The Conservatory, Golden Gate Park, San Francisco, 15 January 1994. Prototype BetterLight Scanning Camera. 6000x7520 pixels. 12-bit Trilinear Array. 2. Right above, Mike Collette, president of BetterLight Inc. THE DAY FILM DIED - JANUARY 15, 1994. 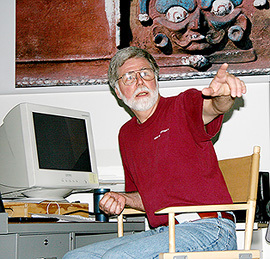 Stephen Johnson is an internationally recognized digital photography pioneer and his photographs are in many collections and museums throughout the world. Johnson was part of the digital revolution from its earliest days, working with Leaf Systems, Foveon, Kodak, Apple, Epson, Hewlett-Packard and Adobe Systems as those companies designed and developed early model electronic and digital photography equipment and imaging programs. 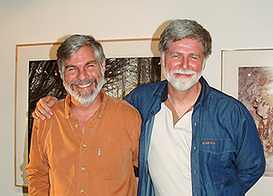 In January of 1994, Mike Collette, formerly of Leaf Systems, had constructed a 140 MB digital scanning back for 4x5 cameras and asked Johnson if he would like to try it. The two went to Golden Gate Park and Coit Tower in San Francisco and took photos of that same area with a film back and then with Collette's digital scanning back. Johnson described the experience thusly: "I took a loop to the film, then zoomed in on the digital file. The difference was hard to believe. That photograph completely floored me. January 15, 1994 was the last day I took film seriously as a recording medium. For me, this was the death of film; it was not a material I could stomach using ever again. From that point on, when I had the choice between film or high-end digital, I was going to pick digital without any doubt whatsoever." Stephen Johnson, On Digital Photography, O'reilly Media, Inc. Sebastopol, California, 2006, page 44. 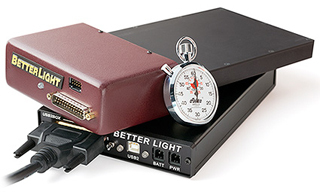 BetterLight 4x5 scannning backs now come in sizes up to 384 megapixels. Interestingly, film supporters continued to hotly champion the superiority of film over digital well past the turn of the century, and some still do today. 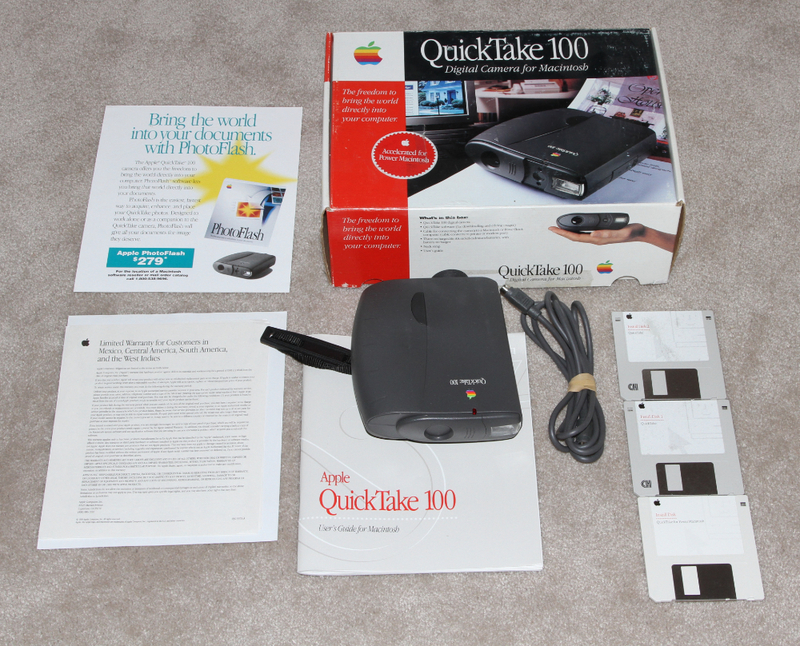 APPLE QUICK TAKE 100 - 1994. Manufactured for Apple by Kodak, the QT 100 was the the first mass-market color digital camera for under $1000 ($749). 640 x 480 pixel CCD. Up to eight 640 x 480 resolution images could be stored in internal memory. Fixed-focus 50mm lens. Built-in flash. In 1995, after the QuickTake 150 came out, owners of the QuickTake 100 could have them upgraded to 150 specs for a price of about $200. A sticker was placed on the camera indicating it was a QuickTake Plus, but no new camera was ever sold with that model designation. We believe we were the first digital camera history web site to provide a photo and information concerning this camera. AP/KODAK NC2000 AND NC2000E - 1994. First professional digital camera marketed specifically for photojournalists. 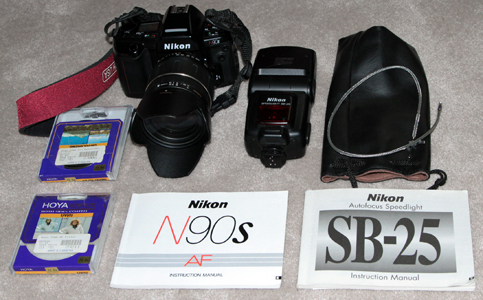 Associated Press announces marketing of digital SLR cameras for photojournalists based on the Nikon N90 and N90s. 1024 x 1280 (1012 X 1268 usable) pixel CCD. ISO 200 - 1600. Shutter 1/8000 to 30 seconds. The Vancouver Sun converted to all digital photography in May of 1995. The paper became the world's first to convert from a film-based photo-production system to an all-digital camera based photo-production system using AP's NC 2000 camera. The staff realized that it was a tool that would revolutionize the newspaper and wire service industry, and a tool photojournalists had to master. Original MSRP $17,950 ($16,950 for AP members). 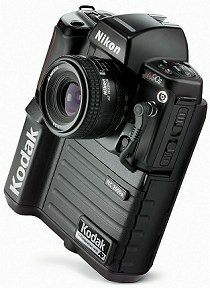 We believe we were the first digital camera history web site to provide a photo and information concerning this camera. 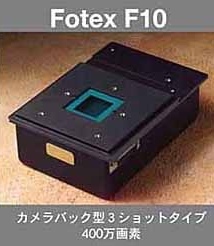 FOTEX F10 - 1994. The Fotex F10 was a digital back with 4 X 5 camera or could also be used as a digital camera with a Nikon or Hasselblad 35mm lens. CCD 2048 X 2048 Pixels. It used a filter wheel and three-shot RGB exposure system for what was very high resolution color images at that time. Produced by Dainippon Screen of Japan. NIKON N90S (F90X) - 1994-2001. The Nikon N90s (F90x) was an autofocus 35mm film camera. It was one of Nikon's best and most expensive amateur 35mm SLRs ever. The N90s sold for over $1,000, even at discount, throughout most of the 1990s, and was sold new through 2004. The N90s was discontinued in May, 2001. The N90s replaced the almost identical N90, which was made from 1992-1994. This camera and its accessories were donated to the museum collection by our good friend and travel companion, Joan Klonowski of Grants, New Mexico. 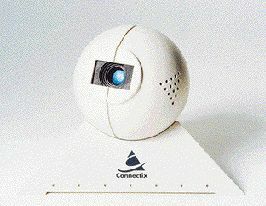 CONNECTIX QUICKCAM - 1994. An inexpensive, black-and-white digital video camera that became one of the best-selling Mac accessories of all time. For $99 (street price) the buyer received a fully digital video camera which used a charge-coupled device (CCD) array to capture grayscale video and still images up to 320 x 240 pixels. Because the camera worked with a PowerBook or a notebook PC, it was possible to capture digital images and video virtually anywhere. QuickCam's small size and weight, along with its positioning flexibility (it could be tripod-mounted, used on its supplied stand or hand-held) made it a favorite. 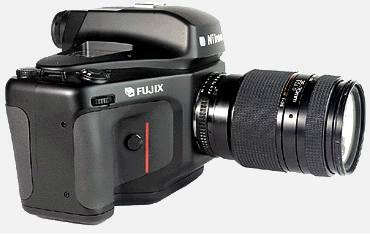 We believe we were the first digital camera history web site to provide a photo and information concerning this camera. EPSON DESKTOP COLOR INKJET PRINTER, MJ-700V2C �€“ 1994. The first 'photo quality' desktop inkjet printer. At 720 by 720 dots per inch, it offered double the resolution of other color printers of the time. HASSELBLAD DIGITAL CAMERA DESIGN - 1994. UMEA University Institute of Design in Collaboration with Hasselblad Electronic Photography. Degree Project by Stina Nilimaa who graduated in 1995. We believe we were the first digital camera history web site to provide a photo and information concerning this camera. FUJI DS-505, DS-515 (Nikon E2, E2S) - 1994. Considered to be the first full-frame (no crop factor - 36 X 24mm) digicams. 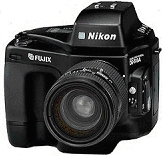 The Fuji DS-505/DS-515 and Nikon E2/E2s digital cameras were PC card (ATA) equipped SLRs that were compatible with a wide range of interchangeable Nikon lenses and accessories. 2/3-inch, 1280 x 1000 pixel CCD. ISO 800, 1600. Shutter 1/8 to 1/2000 second. Digital Photography, David Busch, 1995, p51. We believe we were the first digital camera history web site to provide a photo and information concerning this camera. 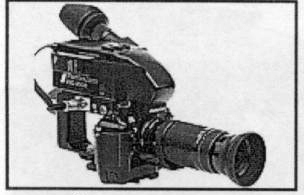 THE FOCAL POINT PENTACAM VSC/3000 Hydra Camera - 1994. A company called The Focal Pont introduced this unusual still video camera in 1994. It consisted of a Sony video camera combined with a Nikon F4S 35mm SLR film camera. 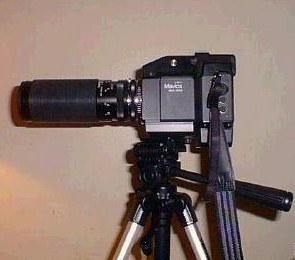 It could take still or video images, but required a videotape recorder, frame grabber, computer, and of course a lens, none of which were included in the $23,000 price. 768 x 494 three-chip CCD. 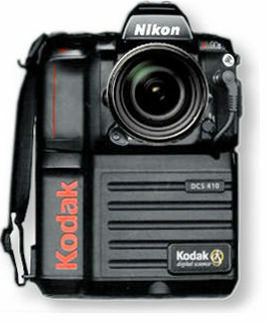 KODAK DCS-410 - 1994. Based on Nikon F90 body (some models may have used N90 or 90s body). 1012 x 1524 pixel CCD. ISO 100. Could accommodate most Nikon lenses and accessories. It used the same Kodak 1.5-million-pixel CCD as the $11,000 DCS 420 (1994), which had a resolution of 1524 x1012 pixels. 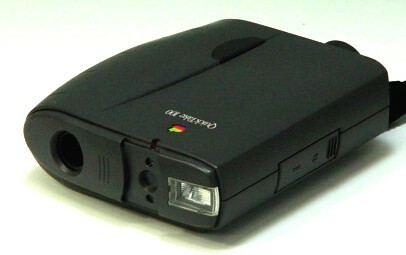 It was the only midrange filmless camera that featured a color depth of 36 bits. MSRP $7995. We believe we were the first digital camera history web site to provide a photo and information concerning this camera. 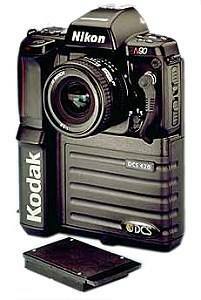 KODAK DCS 420, DCS 420c, DCS 420m, DCS 420ir - 1994. Based on Nikon N90X. 1524 x 1012 pixel images. Image storage on removable PC cards, Type III 12 bits/color. 14 mm x 9.3 imager magnified focal length of the lens 2.5X. SCSI interface. ISO-equivalent settings of 100 to 400 for color model, 200 to 800 for monochrome model. Burst rate of 2 images/second for 5 images, enabling 5 images in just over 2 seconds from camera to capture. MSRP $11,000. We believe we were the first digital camera history web site to provide a photo and information concerning this camera. NIKON E2, E2S (Fuji DS-505, DS-515) - 1994. See Fuji DS-505 and DS-515 above. "First digital SLR's to not have a 'crop factor' and are still the only 35mm-family ones to do it with a smaller than fullframe sensor." Andrew K. Bressen. 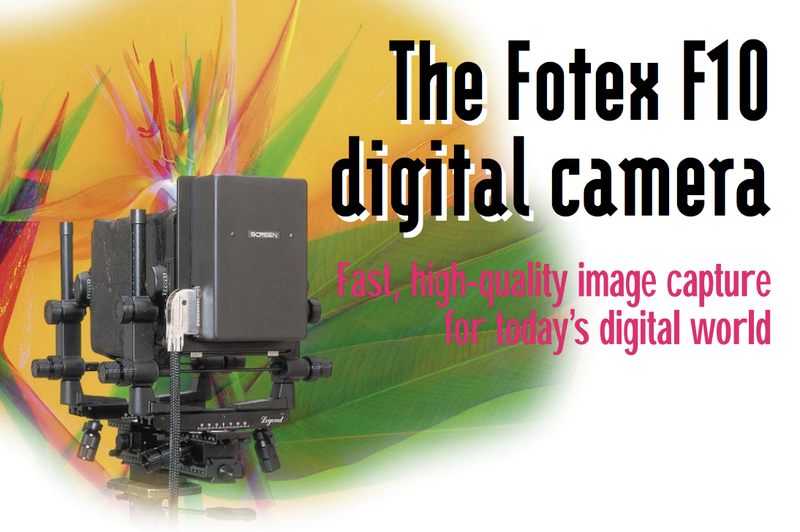 We believe we were the first digital camera history web site to provide a photo and information concerning this camera. NIKON ZOOM 700 QD - 1994. 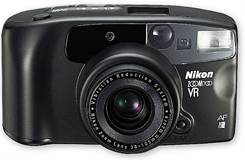 The first 35mm camera with an image stabilization feature (vibration reduction) was the Nikon Zoom 700VR QD 35mm film compact camera released in 1994. It used two types of sensors in its lenses to detect movement to identify the direction and scale of shaking at the time of exposure. The result was used to drive a compensatory optical system using a linear motor to reduce the movement of the image in real time. OLYMPUS DELTIS VC-1100 - 1994. The VC-1100 was the world's first digital camera with built-in transmission capabilities. Photojournalists and other photographers could connect a modem to the VC-1100 and upload digital photos over cellular and analog phone lines. The camera, which had a built-in zoom lens and an image-capture resolution of 768 by 576 pixels, stored images on PCMCIA cards. Its color LCD viewfinder let you preview photos on location. Shutter 1/8 to 1/1000 second. Lens 54mm and 108mm. The VC-1100's transmitter enabled pictures to be sent over phone lines or a cellular network to a second camera or personal computer. The Deltis transmitted at the rate of one frame every one to six minutes, depending on the picture quality required. The 21-ounce camera, a battery pack, and memory card cost about $4000. The VC-1000 did not have transmission capability and was around $300 cheaper. We believe we were the first digital camera history web site to provide a photo and information concerning this camera. RHYTHM WATCH Visimo - 1994. An article about the Visimo appeared in the New Scientist magazine of May 1994 (click on URL below), however, a book by Akira Kasai is the first we have seen that listed the Visimo (reprinted from the March 1997 issue of Future Image Report magazine). When the Visimo was marketed we do not know, but apparently in Japan only. 737 x 480 pixel CCD. 50mm lens. First digicam to have a liquid crystal display screen (LCD) . We believe we were the first digital camera history web site to provide a photo and information concerning this camera. Akira Kasai. Essentials of Digital Photography. 1997. Chapter 11, Page 13. 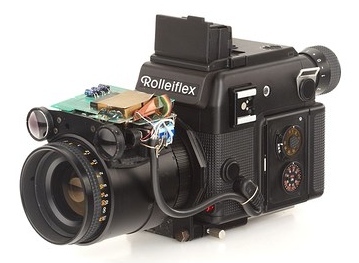 ROLLEIFLEX 3003 STILL VIDEO PROTOTYPE - 1994. 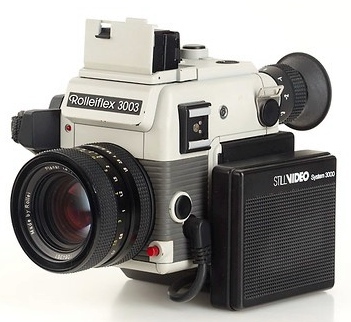 The 3003 still video prototype was based on the Rolleiflex 3003 35mm SLR film camera, possibly only one or two made. ROLLEIFLEX SL 2000F STILL VIDEO PROTOTYPE - 1994. The SL 2000F still video prototype was supposedly based on the Rolleiflex SL 2000F 35mm SLR film camera, apparently only one made and kept for a while in the Rollei museum, then sold for a very high price. Questions have since been raised as to whether it really was a still video type or not. A still video camera at that time would have recorded onto a small mini floppy disk. From the one view above it is not possible to tell whether provision was made for inserting the required floppy. One site on eBay is currently asking $9,995 for this camera (March 2019). If it is not a still video prototype as one site claims (second URL below), there could be a problem. SONY MAVICA MVC-5000 ARMY - 1994. During the Gulf War the U.S. Army used a modified Sony MVC-5000 to send digital images to elsewhere. It used a 400mm, 60 to 300mm zoom lens. 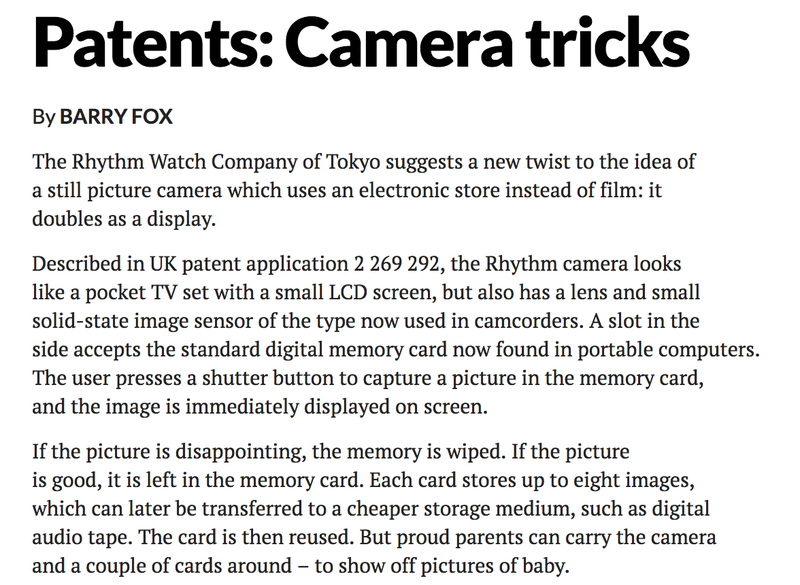 The camera images could be manipulated and time/date stamped. 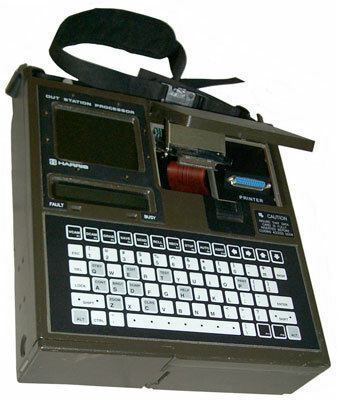 The system was referred to as the CP-2098A/U Digital Imaging Set. The set included a Harris Image processor and several other pieces of equipment. See URL below for additional photos and further information. Also see our 1989 page for use of a similar system during the uprising in Tianamen Square, China. VLSI PC CARD CAMERA - 1994. The first ever PC card camera was marketed by VLSI Vision of Edinburgh, England. Black and white pictures with 320 X 240 pixels, 256 grayscale. MSRP $599.